I had one thing on my mind, a hot tub. Not your classic hubba-tubba sensational backyard spa package made out of plastic and filled with chlorine, but a hot tub to end all hot tubs. We were on a journey through Guatemala and on our way to this hot tub. Our boat drove across the lake on a rainy day, full of travelers, backpacks, backpack owners, locals traveling across the lake, and their own belongings. I sat cautiously trying not to step on the chickens in a bag on the floor of the boat. The nice lady next to me threw the bag full of live chickens on the floor next to me when she got on the boat. The ride across lake Atitlan in the Guatemalan highlands reminded me of a Mediterranean coastal setting. High rocky cliffs connecting straight into the water, at the top of the cliffs plants and trees overflown to the edge of the cliff, and the water at the base of the cliff was blueish green. As we came around the edge of a peninsula we saw a group of Tuscan style stucco buildings built into the cliff side. 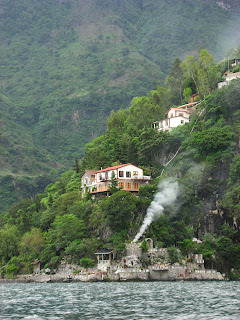 From one end of the complex white smoke rose from a balcony built into the cliff side. 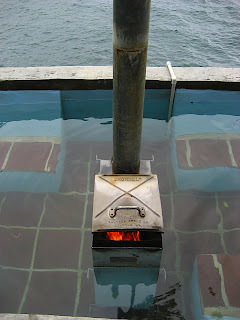 I knew what this was as soon as I saw the smoke, the wood fired hot tub. Yes, my dreams came true. Forget everything, forget travel, forget experiencing Guatemala, the local indigenous Maya farmers, towns, and cities, just put me in the hot tub for a week, feed the fire to keep the water warm, and keep a continuous supply of coffee, beer, and wood to the edge of the hot tub. This thing is all natural, water pumped and screened straight from the lake, and a sealed metal firebox in the middle of a poured concrete and tile basin built directly into a stone balcony on a cliff side over looking the lake and surrounding volcanos. Welcome to La Casa del Mundo, our hot tub oasis in Guatemala. Humble accommodations, but extremely comfortable. The inn consists of a large number of buildings that can be access via paths and steps across, up, and down the steep embankment the complex is built into. Stone balconies are everywhere for you to relax and watch daily life on the lake go by. Make your way to the main building where the office and restaurant is located to book your time at the hot tub or arrange dinner reservations. Dinner is not included in the price of a nights stay, but is well worth the cost. Dinner is served in a communal dining area with a rotating prix fixe menu that includes vegetarian options. Wine and beer are available as well. Breakfast and lunch is the same deal, but private tables and slightly more options available on the menu. In the end we had quite a stay, the best of it spent during long rainy evenings after dinner playing euchre on the big patio of the main building. There are plenty of volcanoes and trails to hike in the area. Check at the desk to get directions and/or arrange guides to the trails. All transit is done by boat (no cars), so to get to other lake towns jump on the next boat that pulls up to the dock, or hit the trail at the top of the hill behind the inn and hike to the next town!